Anyway, I've spent quite a bit of time (and money) online this week on maternity dresses and tunics and so I am eagerly anticipating their arrival in the desperate hope that some of them fit me and they are comfortable. So, as I can't buy clothes with the same type of pleasure I used to, I have turned to beauty products to fill the gap. Over the weekend I came across quite a few blogs written by women who are or have recently been pregnant. They were all full of wonderful tips and hints and lots of 'real' stories about pregnancy and I have spent most nights since then ignoring the hubby as I eagerly read everything (and I mean everything) that they have to say. Unfortunately, my skin hasn't been the best the past few weeks; I am certainly not feeling the so called pregnancy 'glow' and one particular blogger (who you can find here and I encourage you to read her blog as it is fab!) was talking about a facial scrub that they thought was fab after pregnancy so I popped to Boots after work today as I needed a few other bits anyway and I got a bit carried away. 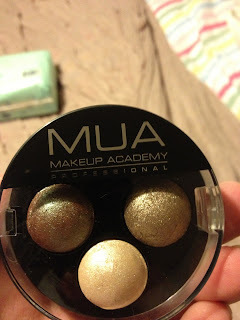 I love a good beauty product. I used to subscribe to Glossybox and loved the excitement of all the little products that came through the post each month. But I cancelled it when I found out I was pregnant. I thought £12.95 every month on things that, in all honesty, I don't really get around to using, was getting a bit excessive. Now, I can't claim that any of these products actually work yet as I haven't tried them, besides the facial scrub and so far so good with that, but they made me happy buying them and the hubby would be impressed (if I actually told him I had bought things) as there were lots of offers on in Boots and I managed to get some bargains! So first up is the Neutrogena Pink Grapefruit Daily Scrub. Charlotte from Write Like No One's Watching recommended this on her blog and my skin has been rubbish lately, so I thought I would give it a go. 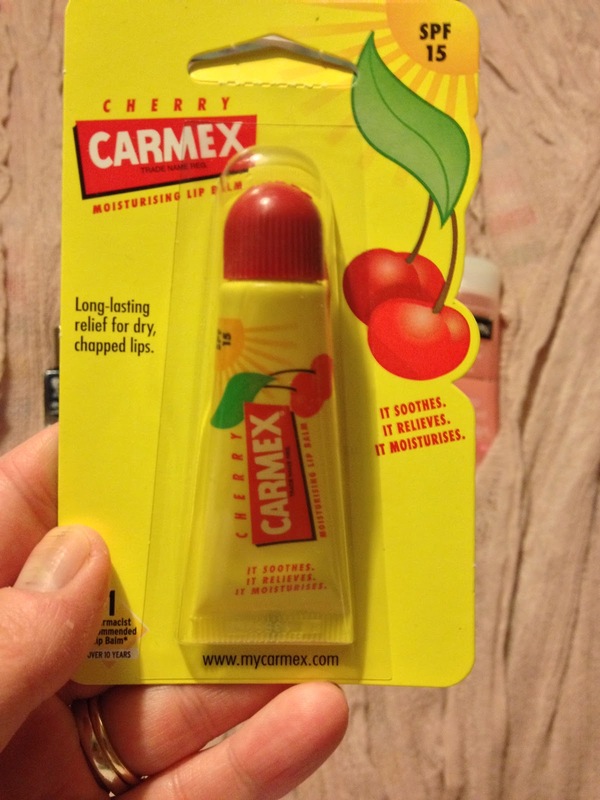 Next up is the Carmex cherry flavoured lip balm. I've heard lots of good things about Carmex lip balms, so I am expecting good things from this. I may be disappointed. The smell is divine anyhow and I am looking forward to using it. 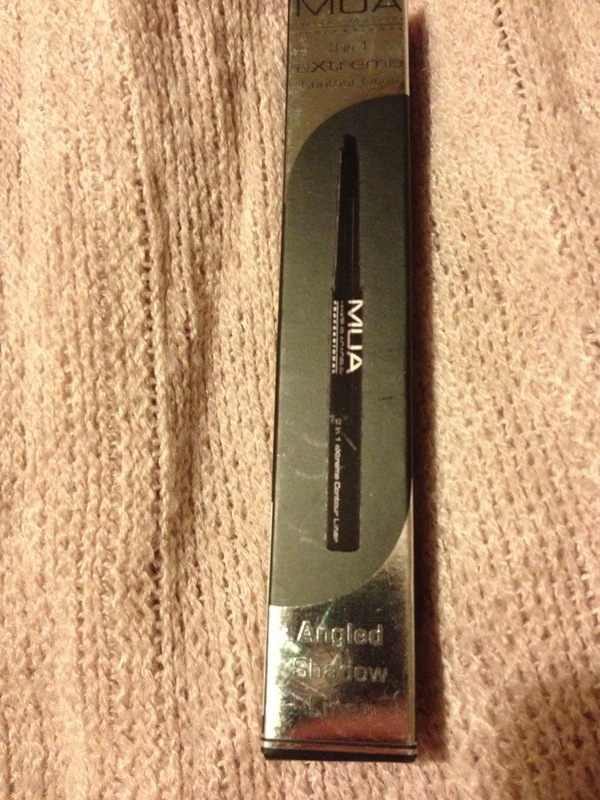 Next is a product that I have never used before, but I love the brand - MUA from Superdrug. Dead cheap and supposedly pretty good, or so I've been told. This product is supposed to be multi-functional. It's called a 3 in 1 extreme contour pen. 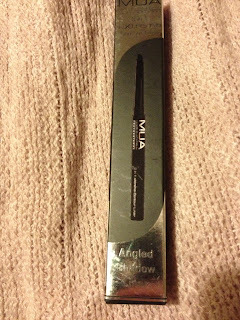 Now I don't actually know what this means but I am going to use it as an eye-liner. The the colour is lovely, it's called Auburn and I think it will look lovely with the eyeshadow I bought to match it. At £1.50, if it's rubbish then it doesn't matter. Then, we have another product that Charlotte recommended to me last night on Twitter. 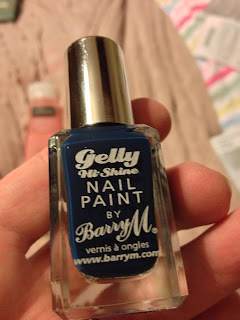 I haven't tried this yet, but the colour is fab and it looked really good in the pic that Charlotte put up. This nail varnish by Barry M is called Raspberry and I have been wearing it for years, well since it came out... It's very autumnal and not too red so I look like a tart. 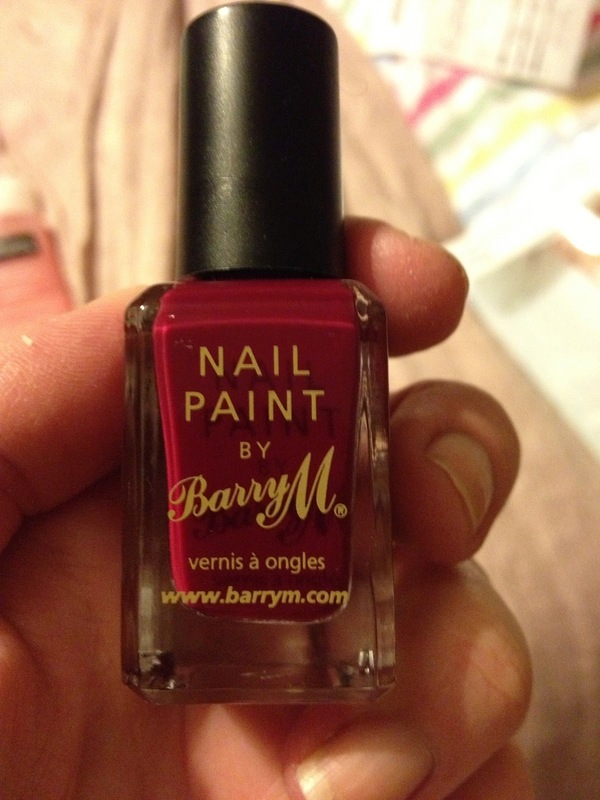 Boots had an offer of buy one get one half price on Barry M so this was only £1.49 as the one above was £3.99. Bargain. Finally, I picked up two lipsticks, again from the MUA range in Superdrug. I have a had a few of these in the past and the colours are always really nice but they can be a bit dry. 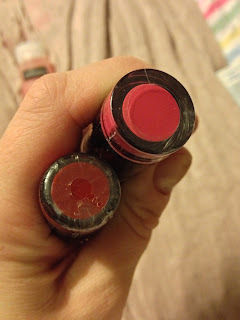 I use A LOT of Vaseline so this isn't a problem for me as I just put it over the top of the lipstick. I got shade 1 and shade 8. So, all in all a successful little after work trip! 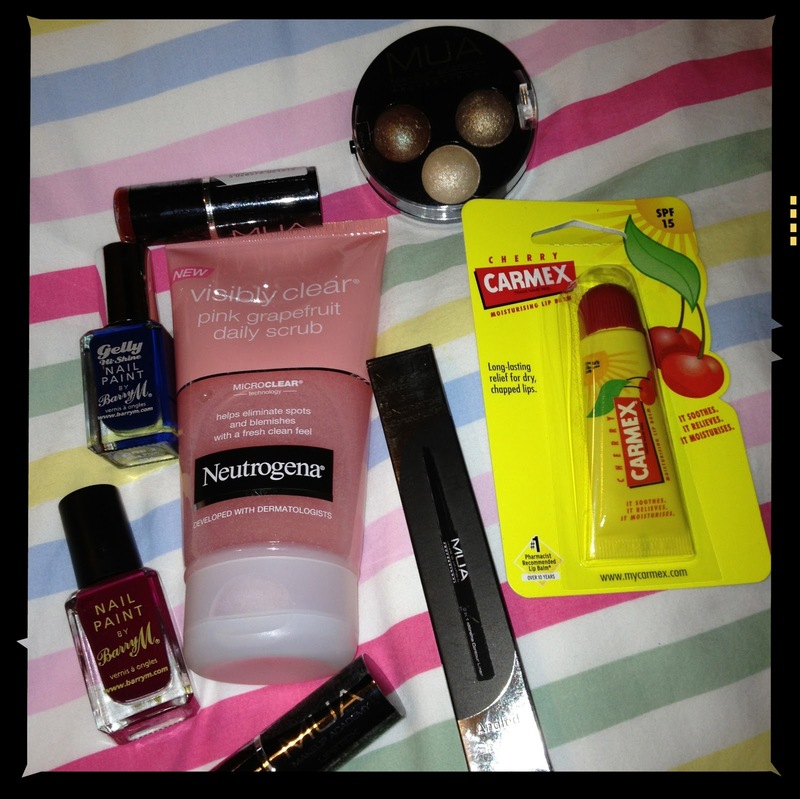 I only spent £20, which, for the amount of things I got, I think is pretty good. I will update you another time as to how successful they have actually been though! Have you got any beauty product recommendations for a pregnant woman? !